Japanese rider Taiji Nishitani (Aisan Racing) won the fourth stage of the Tour de Langkawi on Thursday, while German Tobias Erler retained the overall lead. Nishitani scores only the third Japanese stage win in the history of the Tour. 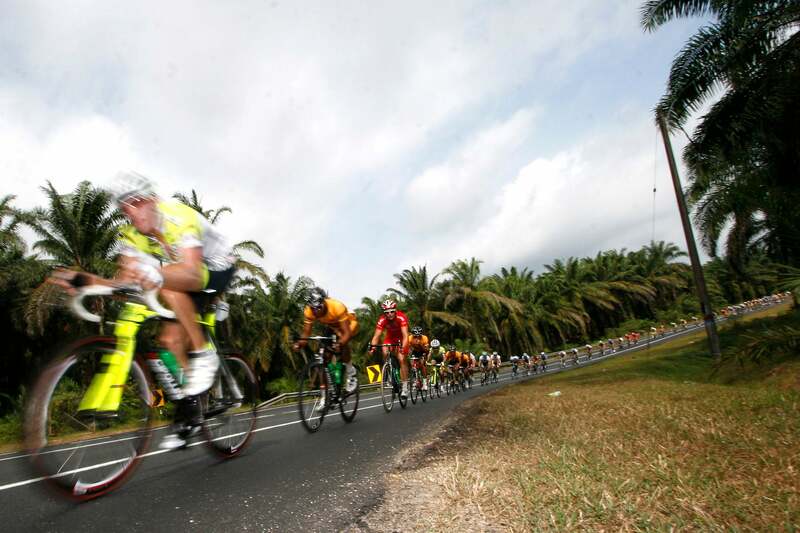 Taiji Nishitani (Aisan Racing) earned the third Japanese victory ever in the Tour de Langkawi, outsprinting the field at the end of a 163.5-kilometer stage from the seaside resort of Mersing to Parit Sulong on Thursday. The 29-year-old Japanese national road race champion scorched it on the slightly-downhill finish, holding off the double stage winner Michael Matthews (Jayco-Skins) and his own teammate Kazuhiro Mori to take the top spot on the podium. Nishitani said the stage win marks a highlight in his career. Overall race leader Tobias Erler and Tabriz Petrochemical Cycling team squad protected the German’s hold on the yellow jersey, working tirelessly to monitor and control breakaway attempts. The peloton never allowed the break to get more than five minutes. Tabriz and Erler kept tabs on things until Swiss competitor Silvere Ackermann (Vorarlberg-Corratec) and Malaysian rider Ali Fallanie (Malaysia National Team) attacked thirty kilometers after the start in Mersing. Neither of the escapees represented a big threat to his race lead, and they were given free rein to build a maximum advantage of four and a half minutes. Fallanie picked up two bonus sprints, at Kluang and Yong Peng, before Ackerman surged ahead alone after 140 of the day’s 163.5 kilometers had been covered. Ackerman then took top points on the day’s sole KOM climb at Kg Sri Jasa and tried to hold on for the stage win, but was finally caught five kilometers from the line. Erler rolled in thirteenth on the stage, staying five seconds clear of David Pell (Drapac Porsche) in the general classification. Stage two winner Jay Thomson (South Africa) remains third, a further two seconds back. “I have to say thanks to my team for their work in the first thirty kilometers, until the break rode away. I had really bad legs from yesterday,” Erler said. “Yesterday I did a lot of work for myself and today they had to help me as my legs were really not good. The jersey holders line up at the start. Most of the GC contenders appeared content to bide their time until Saturday’s crucial stage to Genting Highlands. That also appears to be the case for those in the running for the King of the Mountains jersey; Peter McDonald added a point to his total on Thursday and remains on top. The same cannot be said of those fighting for the green jersey of points leader, as there was a real battle on the road today. 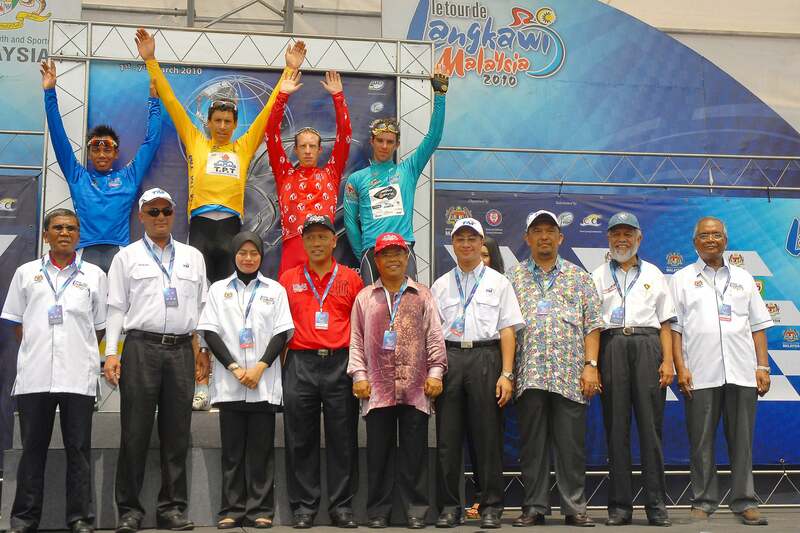 The first of three intermediate sprints took place in Jemaluang, just 14.6 kilometers after the start, and there Matthews overtook the total of points leader Anuar Manan (Geumsan Ginseng Asia) when he won the sprint. Manan was not placed in the first four and needed to fight back in the subsequent gallops. The long-distance breakaway by Fallanie and Ackermann mopped up some of the available points, but in finishing third and fourth in the next two intermediate sprint marks, he ensured that he was level with Matthews going into the crucial finishing sprint. It was there, however, that the Australian came out best. “I was actually 20th wheel back coming into the sprint,” Matthews recalled. “I wasn’t going to go for it at the end as I didn’t feel too good. Also, coming into it, it was just way too dodgy – there were people going everywhere. It wasn’t really worth crashing for, so I was just going to sit up. Manan was just sixth in the finishing gallop and ended the day three points back. He said afterwards that he felt that wearing the green jersey meant he was a watched man. “Today the race was very hard because I was fighting with Matthews to get the sprint points. The first sprint was unlucky for me as a lot of riders seemed to be fighting with me as I wear the green jersey. Many riders focussed only on me, and were not looking for Matthews,” he explained. “I didn’t get the points there. I tried to get the points in the second one, but two riders were in the breakaway and so there were not too many points. Manan, however, still has the consolation of holding on to the blue jersey of best Asian rider, but is certain to fight back in the days ahead. While he is certain not to figure on the gruelling mountain climb to Genting Highlands, he should be capable of capturing points on Friday and Sunday if those stages come down to bunch sprints. After Thursday, the same can be said for Nishitani. It took him a couple of days to find his legs, but he’s up to speed now. Asian cycling also triumphed, as the victory is proof that the riders have moved to a new level. Nishitani’s blistering final sprint saw him beat some very good competitors from Europe, Manan’s performances all week have highlighted his ability and determination, and the general aggressive attitude from the riders from Malaysia and elsewhere in Asia have been very encouraging. More of the same can be expected on Friday’s stage, a relatively flat 111.5km run from Muar to Port Dickson. Nishitani readies for the podium. 2. Michael Matthews (AUS), Team Jayco-Skins, s.t. 3. Vidal Celis (ESP), Footon-Servetto, s.t. 4. Kazuhiro Mori (JPN), Aisan Racing Team, s.t. 5. Rene Haselbacher (AUT), Vorarlberg-Corratec, s.t. 6. Anuar Manan (MAS), Geumsan Ginseng Asia, s.t. 7. Hossein Nateghi (IRI), Azad University Iran, s.t. 8. Dennis Pohl (GER), Giant Asia Racing Team, s.t. 9. Rene Weissinger (GER), Vorarlberg-Corratec, s.t. 10. Dmytro Grabovskyy (UKR), ISD-Neri, s.t. 7. Taiji Nishitani (JPN), Aisan Racing, s.t. 9. Alex Candelario (USA), Kelly Benefit Strategies, s.t.